The wide range of pumps found in our homes can be categorized depending on the method they use to move fluids. The pumping system includes displacement, gravity and direct lift pumps. They are operated differently depending on the type of pump. For instance, there are those pumps that are operated manually, using electricity, by wind power and by engines. It doesn’t matter if you are working as an individual, a company or as contractors, you need to have a supplier who will deliver their pumping systems services in time. With many companies in the industry, it is hard to determine which company is trustworthy. You no longer need to worry since Custom Plumbing Company is here to service and repair your pumps accordingly. Custom Plumbing Ltd was founded in 2001 and has been in the industry ever since. We have acquired the necessary experience to deliver quality and reliable pumping systems service. Our company was first based in Arizona, but we have diversified our services in California over the years. Whenever you are looking for the best supplier of pumping systems services in the Western United States, then Custom Plumbing Company is that supplier. We will service your pump and repair any damages professionally and promptly to avoid any inconveniences. We are proud to offer outstanding products and an excellent service. Our team is committed to ensuring that we meet the best standard of ethical business conduct. We have received a lot of positive feedback from contractors and businesses that have hired us to deliver exquisite pumping services. We service, repair and supply pumps and parts from renowned manufacturers such as Blackmer, NOV, SAER, Wilden, Mouvex and Jessberger. The fact that we have access to these leading suppliers means that our pumps are of high quality and durable, hence offering great value for your money. It does not matter if you are individuals, contractors, or companies, we got you covered. We will work closely with you to ensure that we deliver solutions that suit your requirements. Our pump categories include Centrifugal Pumps, Rotary Lobe Pumps, Eccentric Disk pumps, reciprocating pumps, Progressive Cavity Pumps, Submersible pumps and AODD pumps. For residents of Mesa, Chandler, Glendale, Tempe, Gilbert, Goodyear and Scottdale, you can contact us through our official telephone number 925-609-2400 (California) and 602-866-2665 (Arizona) .The Company offers Wholesale pumps & pumping equipment, Pump repair kits, Pumps & pumping equipment repair service, Spare parts for a dosing pump, Well pump spare parts, Pump casings and others. If you are individuals, business entities or contractors, we’ve got all you need for your pumping requirements. 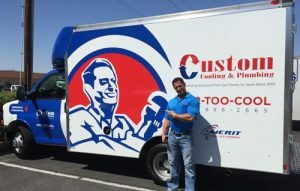 Visit our website at www.customplumbingaz.com to get more information about our efficient services. Whether you live in Scottdale, Glendale, Mesa or Tempe, you can get customized repair services from our revered company. Call us today to discuss about which water heater repair service you want. You’ll be pleased by our incredible flexibility. We respond immediately to your request, ensuring that you don’t bear with cold water for long.